Please note that the information contained in these pages represents historical documentation and is intended for educational and research use only. This site is non-profit making. 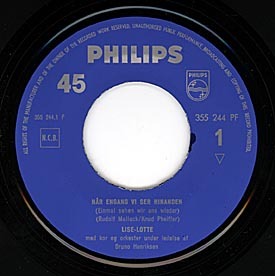 Image and multimedia files on these pages are provided for strictly non-profit research about The Danish Beat, Pop and Rock Scene in the late fifties and sixties. Copyrights may be held by various and respective owners. Owners of these rights can request withdrawal of material by E-MAIL. No copyright infringement is intended. Please note that some files are several megabytes - allow time to download !